The latest trailer for Ralph Breaks the Internet, a.k.a. Wreck-It Ralph 2, is the best reveal for fans to learn the plot points, the weird Internet theme as Ralph and Vanellope ventured out to search for a replacement part for the Sugar Rush arcade game. Check out the new trailer for Ralph Breaks the Internet below and new poster. 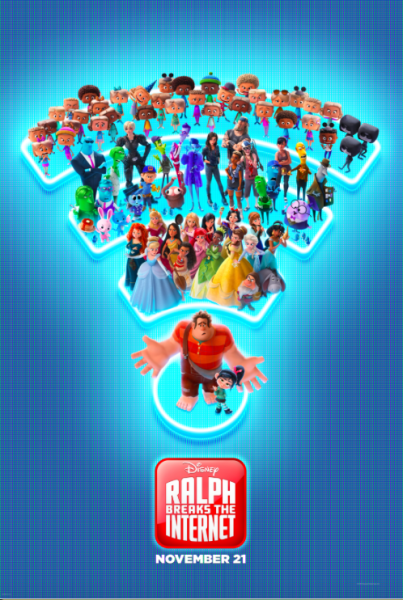 Ralph Breaks the Internet stars John C. Reilly, Sarah Silverman, Gal Gadot, Jack McBrayer, Jane Lynch, Alan Tudyk, Alfred Molina, Ed O’Neill, Ali Wong, Timothy Simons, Glozell Green, Hamish Blake and Taraji P. Henson. There is also the Disney Princesses, and the list is long: voice actors include Kristen Bell (Anna from Frozen), Jodi Benson (Ariel in The Little Mermaid), Auli‘i Cravalho (Moana), Paige O’Hara (Belle from Beauty and the Beast), Ming-Na Wen of Mulan, Pocahontas’s Irene Bedard, Tangled’s Mandy Moore, Kelly MacDonald (Merida in Brave), The Princess and the Frog’s Anika Noni Rose and Frozen’s Idina Menzel. The sequel is co-directed by Rich Moore and Phil Johnston and arrives in theaters on November 21st.